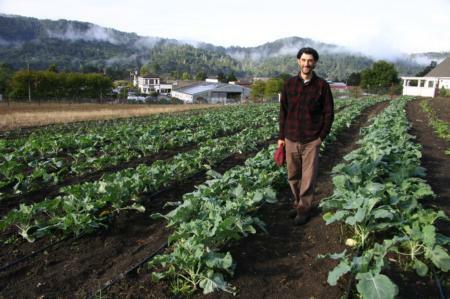 Of Marin’s approximately 160,000 acres of agricultural land, fewer than 400 are in fruits and vegetables. Is it possible to grow this to 1,000 acres (a target anecdotally cited as both ambitious and doable) - and if so, how? One promising option is to support new and beginning farmers like Arron Wilder and Caymin Ackerman. Starting a farm is a challenge anywhere. In addition to the farming knowledge and ability, it requires access to land and water as well as a viable business plan. Land in Marin, and especially land with both farmable soils and available water, is at a premium. It is equally important and difficult to develop a customer base and accounts for produce grown prior to planting the first seedlings. Arron and Caymin have risen to the challenge with the right mix of creativity and resourcefulness, along with a keen ability to network. It is not fair to refer to Arron or Caymin as new and beginning. Both have put in their time to gain the skills and experience needed to farm in California. Additionally, they both arrived at the moment in time when they desired to run their own operations. The result is the respective starts of Table Top and Big Mesa farms in the last five years. The self-serve farm stand was open for business when I arrived at eight in the morning. There was kale, tomatoes, lettuce, raspberries, and squash available on the honor system. No bar code readers needed, just Arron’s commitment to “a strong farming capacity in the community.” He is concerned about people and communities losing their farming foundation and is addressing this through his farming and community building. 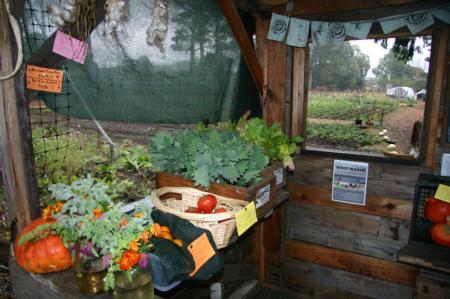 In addition to the farm stand at the farm, Arron supplies a west Marin CSA (community supported agriculture), local restaurants, and the Foodshedorganic bulk food cooperative (previously in Inverness with plans to reopen in 2015 in Point Reyes Station). Arron has a Bachelor’s degree in Soil Science from Humboldt State University. He has apprenticed for several years on farms, including with John Jeavons, author of How to Grow More Vegetables, a global how-to-resource now in its 8th edition. Arron also has kept a day job until this year with a Bay Area environmental consulting firm. This is common for farming and ranching, with off-farm income supporting the initial implementation and even expansion of a farm to a viable scale. Standing inside his hoop house to stay dry on the day of Marin’s first rains of the year, Arron and I talked about the need to control soil acidity and how he has managed production during the drought. Invariability, Marin’s soils are slightly acidic. 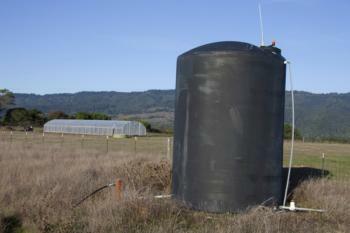 This requires the farmer to amend the soil so the pH will be in an optimal range for plant growth. Arron uses locally sourced ground oyster shells, one source of calcium carbonate that can be used to achieve this. It was one of those clear blue days that reveal the Farallon Islands. Turning off of Mesa Road, they and the Bolinas ridge formed the backdrop for Caymin’s Big Mesa Farm. Caymin is in her third year of production farming a total of five acres on two plots of land. When I arrived late in the afternoon she was cleaning and preparing two boxes of produce - a mix of beets, kale, and onions. She had just finished one of the two long harvest days she does weekly. This is part of her unique business model: she sells wholesale and has from the start. She admits that this approach may be missing out on higher prices for direct sales at farmers markets or even to restaurants. For many reasons, however, the simplicity and continuity of the relationship with local independent groceries works for her. “They really appreciate the quality and consistency of what we grow,” she explained. Caymin is also a Humbolt State University Graduate with a Bachelor’s in oceanography. She started farming while in college, first as a part-time job for Wild Rose and then full-time before returning home. Caymin is an alumnus of Drake High School in San Anselmo and her family lives in Marin. As we walked past one of two ponds that supply water for Big Mesa Farm, four wood ducks rose up and flew off. These are the only water sources for Big Mesa and also for the two landowners’ ranching operations that she leases from. This means sharing and finding solutions for efficient water use. It is important to keep in mind that the Marin agricultural lands are well suited for livestock agricultural production. The rolling hills in close proximity to the coast’s cooler temperatures contribute to a longer growing season for the grasses relative to other parts of the state. This is why the majority of the farms and ranches in Marin have grazed animals and produced livestock agricultural products for over 150 years. Part of this history, however, includes a diversity of crops produced and types of farming. While some vegetable farms and orchards were lost to urban expansion in the eastern part of Marin, small in-holdings of fertile land in the western portion have been maintained and slowly added to over the last 40 years. Experienced and motivated farmers like Arron and Caymin are continuing this effort. They are local faces of Marin’s next generation of farming. 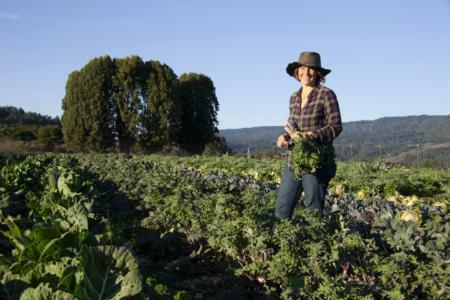 They are demonstrating that there is room for more farming in Marin and that the relationship between the farmer, land owner, and community is a valued table to share. Through efforts like theirs and those of other new farmers, along with the community’s receptiveness, the current 400 acres in cultivation might grow to 1,000, accommodating more farmers and more farms.